Storms are born without warning above the sharply tilted slopes of the Sierra Nevada as masses of fluffy clouds merge into blue-black thunderheads. In October 1905 one such thunderhead rolled through a Sierra canyon. Booms echoed up and down the rocky gorge, and lightning lit up the canyon walls. One lightning bolt shot up into the sky, another down to earth. When a third sliced into the 16-foot-wide trunk of a giant sequoia, the tree’s midsection instantly exploded, sending clots of wood and bark flying. Daylight momentarily showed through the gap between the top half of the tree, seemingly suspended in midair and the bottom half of the trunk. Then the upper half crashed straight down, wedging itself into the grip of the still-living trunk. The Sequoia did not die. It kept on growing, adding new wood each year, and it shows every intention of remaining alive for another thousand years. This will to live, typical of the mighty sequoias, is evident in other living things throughout these two adjacent parks, Sequoia and Kings Canyon. From the plants that bloom in the dry foothills of the Sierra to the tiny plants that cling bravely to windswept alpine peaks, endurance is the key to life. The lightning-split tree was unusual. The sequoia’s bark is such a poor conductor of electricity that lightning rarely affects it, and the tree’s dense coat, sometimes almost two feet thick, enables it to shrug off most electrical storms, brush fires, and insect invasions and to return to work. For giant sequoias, “work” is growing to a gargantuan size. 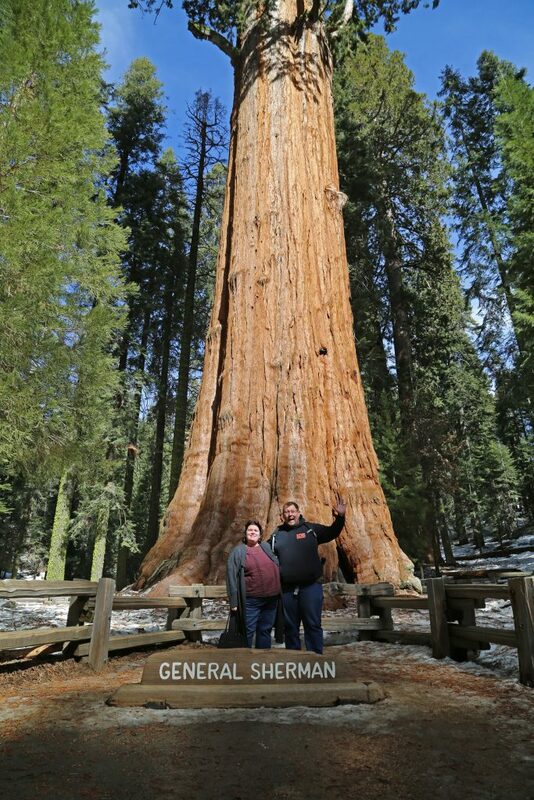 The most successful worker has been the General Sherman tree, which towers to a height of more than 270 feet. Although it is not the world’s tallest or widest living thing, it is by far the most massive in bulk. Weighing approximately 4½ million pounds, it contains enough wood to build more than 40 five-room houses. And it keeps on growing. An indefatigable worker despite its age, between 2,300 and 2,700 years, General Sherman adds enough wood every year to equal a 60-foot-tall tree. In contrast to their staggering size, giant sequoias produce cones that are tiny, hardly as large as a hen’s eggs. Although the cones mature after two years, they can remain tightly closed, hoarding their seeds for 20 years or more, until they are forced open. Yet each autumn the air flickers with reflected light from a glistening rain of sequoia seeds, so minuscule that it takes 91,000 of them to make a pound. Sometimes the seeds fall because they have been freed by the larvae of wood-boring beetles, which munch through the cones’ sap-filled veins. Severed from their lifeblood, the cones shrivel and release their seeds, which flutter to the ground. Other seeds are unlocked by chattering chickarees that harvest the cones for the sake of their fleshy scales. While these squirrels eat the seeds of other evergreens, they ignore those of the sequoias, leaving them to rot or not to take root at the giants’ feet. Once the seeds reach the ground, they need special conditions in order to grow, the nearly bare, mineral-rich earth that is exposed after forest fires. Such fires, usually sparked when electrical storms ignite the scrub and leaf litter on the forest floor, reduce the thick overhead cover of fir, allowing sunlight to nurture the seedlings. The most famous sequoia grove, the Giant Forest, was named by John Muir. Its northern edge is guarded by General Sherman and several of his ancient troops. Other groves are scattered throughout the two parks, but all of the sequoias are limited to elevations of between 3,500 and 7,500 feet on the Sierra Nevada’s western slopes, where the air is crisp, water is plentiful, and winters are mild.